Peaking as a category 4 hurricane on September 28, 2018, over the Eastern Pacific Ocean, Hurricane Rosa weakened before making landfall on the Baja California Peninsula four days later. Still, as the storm’s remnants moved inland, they delivered heavy rain and caused flash floods in northwestern Mexico and the U.S. Southwest. The still image and animation above show the atmosphere’s total precipitable water. That is, the depth of water in a column of the atmosphere if all the water in that column fell as rain. The image and animation, compiled from October 1-3, 2018, were created with data from a version of a NASA model known as the Goddard Earth Observing System Data Assimilation System (GEOS DAS), which uses satellite data and mathematical representations of physical processes to calculate what was happening in the atmosphere. Viewed globally, the model shows large circulation patterns as well as individual storms. This regional view shows Hurricane Rosa as it spun over the East Pacific Ocean and broke up over Baja California and the U.S. Southwest. 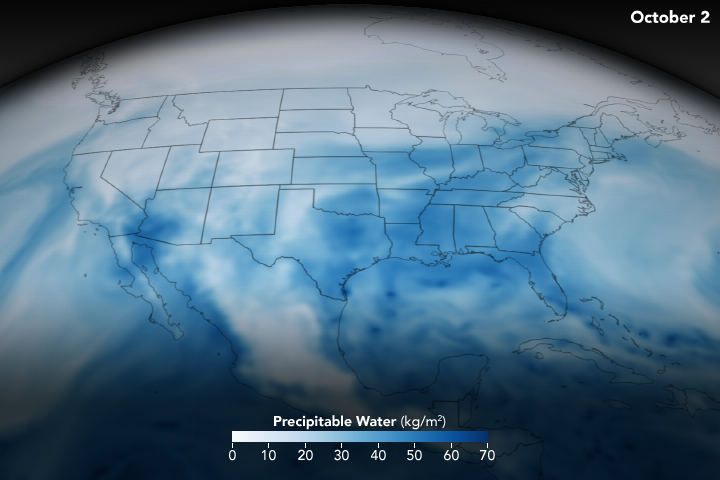 Dark blue areas represent the highest values of precipitable water. Partyka says it is important to note that not all precipitable water falls as rain; some water vapor stays behind in the atmosphere. Nor is it a limit on the amount of rain that can fall, which can increase as water vapor moves into the column of air. “The indicator is useful for showing potential regions where rainfall could be excessive, though you also need a trigger to make the ‘precipitable water’ fall as precipitation,” Partyka said. In this case, Rosa’s remnants and a low-pressure system off the California coast did serve as triggers. According to the National Weather Service, October 2 was the wettest October day on record in Phoenix, Arizona. More than 2 inches (5 centimeters) of rainfall were measured that day at Phoenix Sky Harbor International. The last time the city saw more than two inches in a day in October was in 1988. NASA Earth Observatory imagery by Joshua Stevens, using GEOS-5 data from the Global Modeling and Assimilation Office at NASA GSFC. Story by Kathryn Hansen. NASA provided an infrared view of Tropical Depression Rosa’s remnants that showed strongest storms with heaviest rainfall potential were over east central Arizona on Oct. 2. The National Hurricane Center noted that although Rosa had dissipated by 11 a.m. EDT on Oct. 2, the threat of heavy rains and flash flooding continues over the Desert Southwest. Infrared satellite data captured on Tuesday, Oct. 2 at 6:05 a.m. EDT (1005 UTC the Moderate Resolution Imaging Spectroradiometer or MODIS instrument aboard NASA’s Aqua satellite revealed the location of strongest storms with the coldest cloud top temperatures. MODIS found coldest cloud tops had temperatures near minus 63 degrees Fahrenheit (minus 53 degrees Celsius). NASA research has found that cloud top temperatures that cold have the capability to generate heavy rainfall. Satellite images and surface observations indicate that Rosa has become a trough or an elongated area of low pressure with multiple swirls along its axis. Therefore, Rosa no longer qualifies as a tropical cyclone. That heavy rainfall potential that NASA’s infrared data showed are reflected in the forecast today, Oct. 2 and tomorrow, Oct. 3. In Baja California and northwestern Sonora, 3 to 6 inches are forecast with isolated 10 inches. In central and southern Arizona 2 to 4 inches are forecast with isolated 6 inch totals are possible in the mountains of central Arizona. For the rest of the Desert Southwest, Central Rockies, and Great Basin, the National Hurricane Center forecast expects between 1 to 2 inches, with isolated totals to 4 inches. These rainfall amounts may produce life-threatening flash flooding. Dangerous debris flows and landslides are also possible in mountainous terrain. At 11 a.m. EDT (1500 UTC), the remnants of Rosa were located near latitude 29.7 degrees north and longitude 114.2 degrees west. That’s about 95 miles (155 km) south-southeast of San Felipe, Mexico. The remnants are moving toward the northeast near 8 mph (13 kph), and they are expected to move over the Desert Southwest by tonight. Maximum sustained winds are near 30 mph (45 kph) with higher gusts. Hurricane Rosa continued weakening as NASA’s Aqua satellite passed overhead and collected temperature information. Satellite data showed that Rosa’s center still off-shore from northwestern Mexico, but its clouds and rains had already stretched into Arizona and infrared data showed that rainfall potential. National Hurricane Center (NHC) said a Tropical Storm Warning is in effect for the west coast of the Baja California peninsula from Punta Abreojos to Cabo San Quintin. A Tropical Storm Watch is in effect for the east coast of the Baja California peninsula from Bahia de los Angeles to San Felipe. Interests elsewhere in the northern and central Baja California peninsula and northwestern Sonora should monitor the progress of Rosa. The Atmospheric Infrared Sounder or AIRS instrument aboard NASA’s Aqua satellite passed over Tropical Storm Rosa on Oct. 1 at 5:23 a.m. EDT (0923 UTC). and analyzed the storm in infrared light. Infrared light provides temperature data and that’s important when trying to understand how strong storms can be. The higher the cloud tops, the colder and the stronger they are. When Aqua passed over Rosa, the AIRS instrument found coldest cloud top temperatures in thunderstorms mostly northeast the center where temperatures were as cold as minus 63 degrees Fahrenheit (minus 53 degrees Celsius). Those storms were stretching over northwestern Mexico and into Arizona. Storms with cloud top temperatures that cold have the capability to produce heavy rainfall. At 11 a.m. EDT (1500 UTC), NHC noted the center of Tropical Storm Rosa was located near latitude 27.5 degrees west and longitude 116.5 degrees west. That’s 90 miles (140 km) west-southwest of Punta Eugenia, Mexico. Rosa is moving toward the north-northeast near 12 mph (19 km/h), and this general motion is expected to continue through Tuesday, Oct. 2. Maximum sustained winds are near 45 mph (75 kph) with higher gusts. Some weakening is forecast during the next 48 hours. Weakening is forecast through tonight while Rosa approaches and moves over the northern Baja California peninsula. On the forecast track, the center of Rosa will approach the central and northern Baja California peninsula later today, Oct. 1 and then move across the peninsula into the northern Gulf of California tonight. Rosa’s remnants are then expected to move across the Desert Southwest on Tuesday, Oct. 2. Rosa is expected to become a remnant low over the southwestern United States on Tuesday. For updated forecasts on Rosa, visit: www.nhc.noaa.gov. For local forecasts and impacts in the U.S., visit: www.weather.gov. 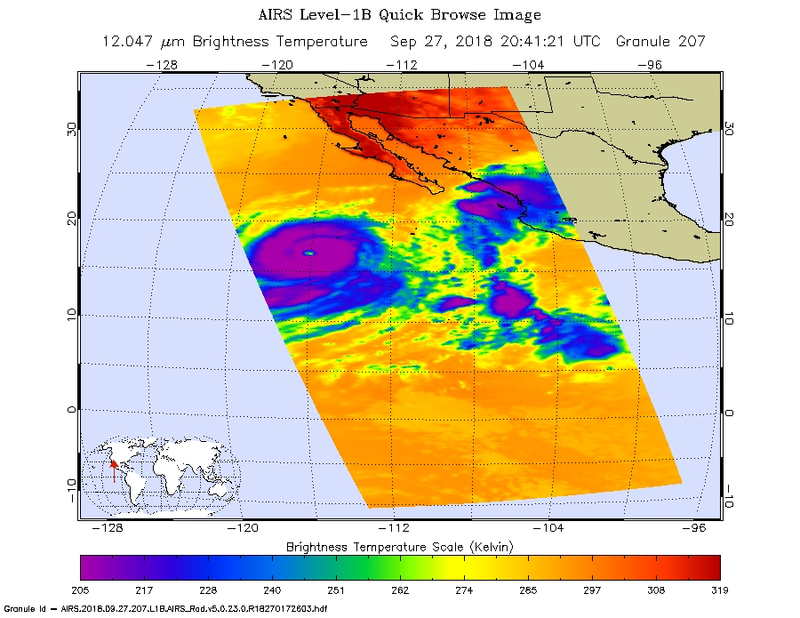 When NASA’s Aqua satellite passed over the Eastern Pacific Ocean, water vapor data provided information about the intensity of Hurricane Rosa. On Sept. 28, Rosa is a major hurricane, now a Category 4 on the Saffir-Simpson Hurricane Wind Scale. 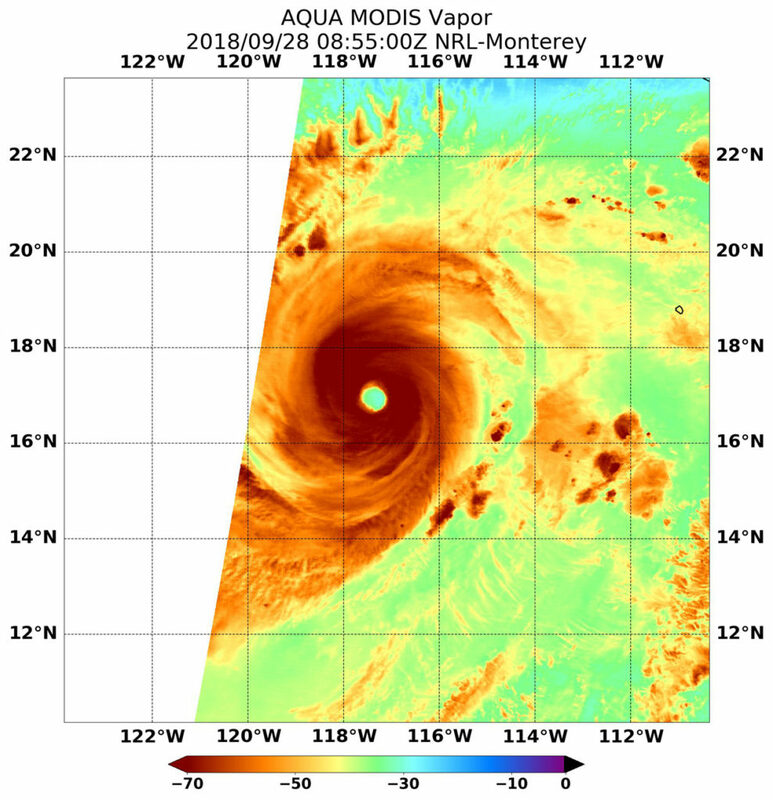 NASA’s Aqua satellite passed Hurricane Rosa on Sept. 28 at 4:55 a.m. EDT (855 UTC) and the Moderate Resolution Imaging Spectroradiometer or MODIS instrument gathered water vapor content and temperature information. The MODIS image showed highest concentrations of water vapor and coldest cloud top temperatures were in a thick ring of storms around the 20 nautical mile-wide eye. MODIS data also showed coldest cloud top temperatures were as cold as or colder than minus 70 degrees Fahrenheit (minus 56.6 degrees Celsius) in those storms. Storms with cloud top temperatures that cold have the capability to produce heavy rainfall. Water vapor analysis of tropical cyclones tells forecasters how much potential a storm has to develop. Water vapor releases latent heat as it condenses into liquid. That liquid becomes clouds and thunderstorms that make up a tropical cyclone. Temperature is important when trying to understand how strong storms can be. The higher the cloud tops, the colder and the stronger they are. 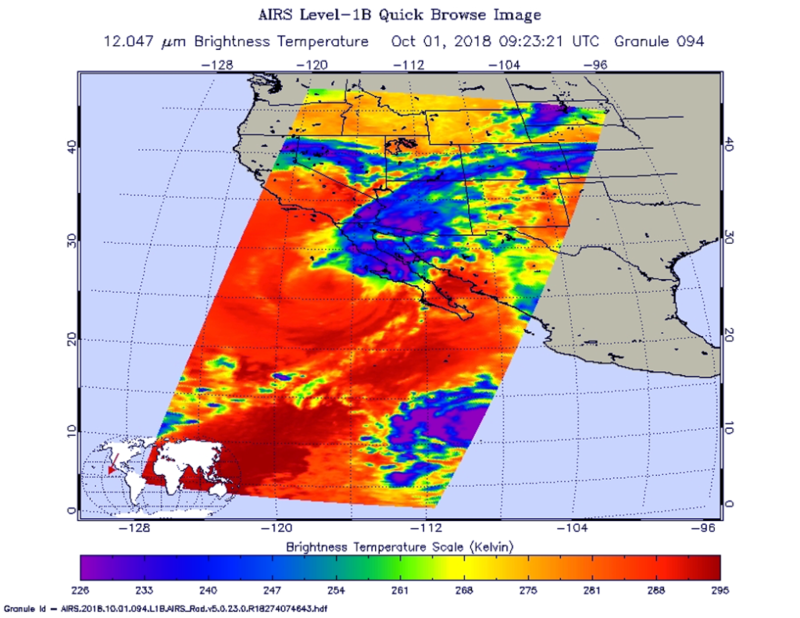 Twelve hours before the MODIS water vapor imagery, the Atmospheric Infrared Sounder instrument aboard NASA’s Aqua satellite provided temperature data on the cloud tops on Sept. 27 at 4:41 p.m. EDT (2041 UTC). Coldest cloud top temperatures were as cold as or colder than minus 70 degrees Fahrenheit (minus 56.6 degrees Celsius) around the eye and confirmed the later MODIS data. At 5 a.m. EDT (0900 UTC), the eye of Hurricane Rosa was located near latitude 16.9 degrees north and longitude 117.3 degrees west. That’s 640 miles (1,030 km) southwest of the southern tip of Baja California, Mexico. Rosa is moving toward the west near 7 mph (11 kph). A gradual turn toward the west-northwest and northwest is expected on Friday, followed by a turn toward the north Saturday night and a turn toward the north-northeast on Sunday. Maximum sustained winds are near 145 mph (230 kph) with higher gusts. Rosa is a category 4 hurricane on the Saffir-Simpson Hurricane Wind Scale. Little significant change in strength is forecast today, with gradual weakening anticipated by Saturday, and further weakening at a faster rate expected early next week. 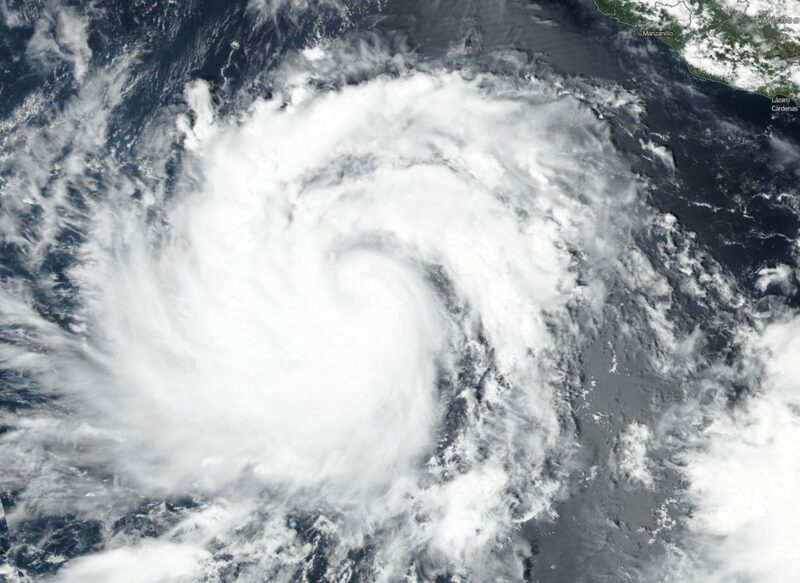 NHC said although Rosa is not near the coast, swells generated by Rosa will affect portions of the coasts of southwestern Mexico, the southern Baja California Peninsula, and southern California late this week and over the weekend. These swells are likely to cause life-threatening surf and rip current conditions. NASA’s Terra satellite passed over the Eastern Pacific Ocean and provided forecasters with a visible image of Hurricane Rosa that gave an indication an eye has formed. Rosa is expected to become a major hurricane by Thursday, Sept. 27. On Sept. 26 at 4:30 p.m. EDT (1630 UTC), the Moderate Resolution Imaging Spectroradiometer or MODIS instrument aboard NASA’s Terra satellite captured a visible image of Rosa. The image showed what appears to be a cloud filled-eye surrounded by bands of thunderstorms. Two thick bands of thunderstorms were wrapping into the center from the west and south. At 11 a.m. EDT (1500 UTC), NHC reported the center of Hurricane Rosa was located near latitude 17.2 degrees north and longitude 115.4 degrees west. Rosa is far enough away from land so no coastal warnings or watches are in effect. Rosa is about 530 miles (855 km) southwest of the southern tip of Baja California, Mexico. Rosa is moving toward the west near 12 mph (19 kph). This general motion is expected to continue through tonight, with a slower motion toward the west-northwest on Friday and toward the northwest Friday night and Saturday. Maximum sustained winds have increased to near 105 mph (165 kph) with higher gusts. Additional strengthening is forecast through Friday, and Rosa is expected to become a major hurricane later today, Sept. 27 or tonight. The hurricane is expected to begin weakening on Saturday. Hurricane-force winds extend outward up to 30 miles (45 km) from the center and tropical-storm-force winds extend outward up to 105 miles (165 km). NHC expects Rosa to take a turn back to the east and weaken. It is expected to make landfall in the northwestern Baja California Peninsula sometime on Oct. 2. NASA-NOAA’s Suomi NPP satellite passed over the Eastern Pacific Ocean as Tropical Storm Rosa was strengthening into that ocean basin’s tenth hurricane. 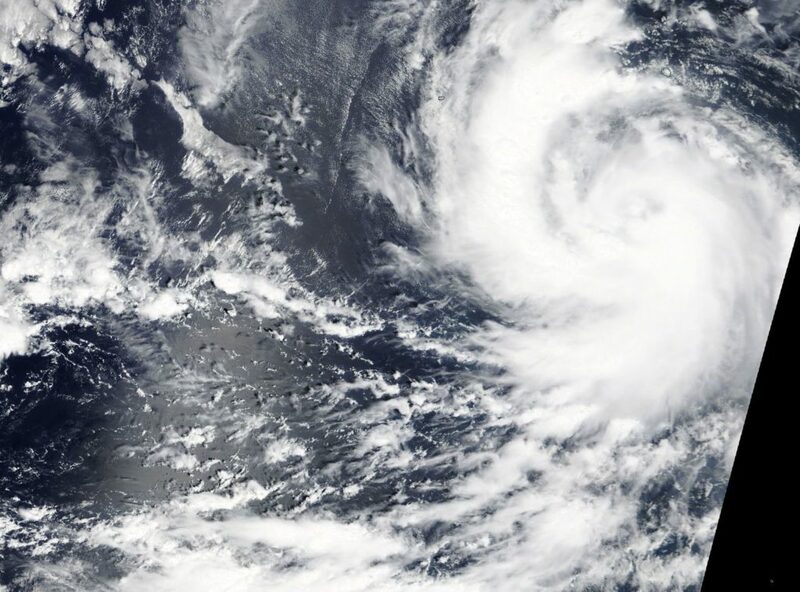 On Sept. 25 NASA-NOAA’s Suomi NPP satellite provided a visible image of Tropical Storm Rosa as it was strengthening to become the Eastern Pacific Ocean’s tenth hurricane. Credit: NASA Worldview, Earth Observing System Data and Information System (EOSDIS) . On Sept. 25, the Visible Infrared Imaging Radiometer Suite (VIIRS) instrument aboard NASA-NOAA’s Suomi NPP satellite provided a visible light image of Tropical Storm Rosa. The VIIRS image showed powerful thunderstorms around the center of circulation and thick bands of thunderstorms spiraling into the center from the northern and eastern quadrants. At 11 a.m. EDT (1500 UTC), the center of Hurricane Rosa was located near latitude 16.1 degrees north and longitude 111.4 degrees west. That’s 510 miles (820 km) west-southwest of Manzanillo, Mexico. Rosa is moving toward the west-northwest near 10 mph (17 kph), and this general motion is forecast to continue for the next two days. A turn to the northwest is expected by Saturday morning. Maximum sustained winds have quickly increased to near 75 mph (120 kph) with higher gusts, and rapid strengthening is forecast to continue through tonight. Rosa is expected to become a major hurricane on Thursday, Sept. 27. 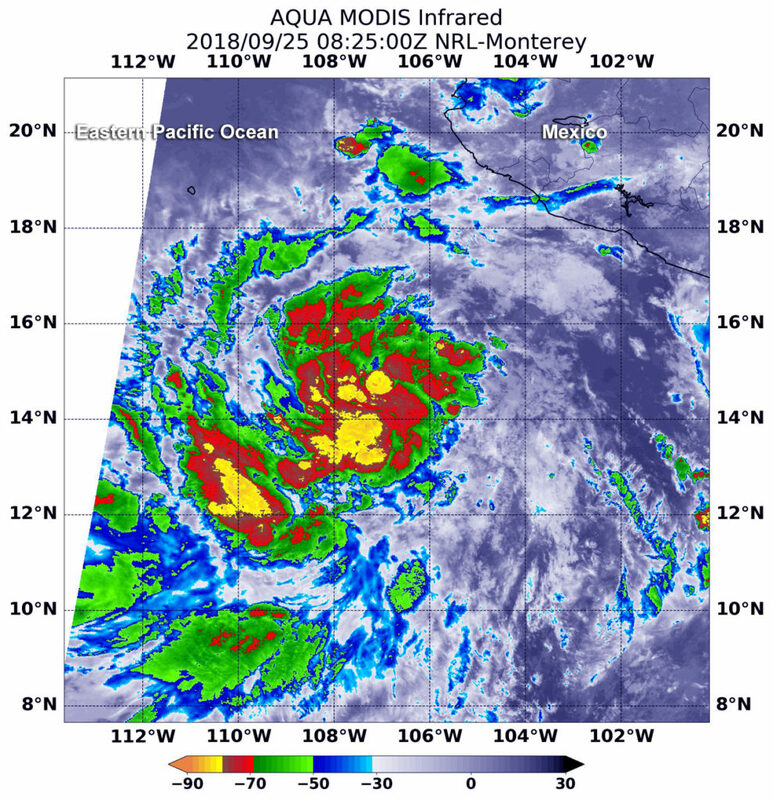 NASA provided an infrared look at newly developed Tropical Storm Rosa in the Eastern Pacific and found the storm was getting better organized. NASA’s Aqua satellite passed over the Eastern Pacific early on Sept. 25 when Rosa was still a tropical depression called 20E. Infrared satellite data taken at 4:25 a.m. EDT (0825 UTC) on Sept. 25 from the Moderate Resolution Imaging Spectroradiometer or MODIS instrument aboard NASA’s Aqua satellite revealed strongest storms with the coldest cloud top temperatures around 20E’s center and in a band of thunderstorms southwest of center. MODIS data showed that the tropical cyclone’s cloud pattern has become better organized, with developing convective banding features and the depression was upgraded to a tropical storm. MODIS found coldest cloud tops had temperatures near minus 80 degrees Fahrenheit (minus 62.2 degrees Celsius). NASA research has found that cloud top temperatures that cold have the capability to generate heavy rainfall. At 9 a.m. EDT (1200 UTC), the center of Tropical Strom Rosa was located near latitude 14.7 degrees north, longitude 108.0 degrees west. That’s about 385 miles (620 km) south-southwest of Manzanillo Mexico, so there are no coastal watches or warnings in effect. The depression is moving toward the west-northwest near 9 mph (15 kph). A west to west-northwest motion at a similar forward speed is expected during the next few days. Maximum sustained winds are near 45 mph (75 kph) with higher gusts. NHC noted that conditions favor continued strengthening, with Rosa likely to remain in an environment of warm waters, low shear, and a very moist mid-level air mass for the next several days. Additional strengthening is likely, and Rosa could become a hurricane on Tuesday, Sept. 25.